Obama's Double Cross on Abortion: Why is everyone so surprised? 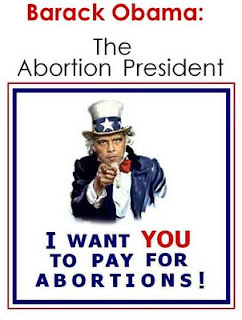 President Obama, after telling the public that he would not support a bill that provided federal funds for abortion (he was hailed by the bishops for doing so), is now championing a bill that would do just that. Moreover, he is pushing for legislation that the American people do not support: CNN posted survey results yesterday showing that 61 percent of the public is in favor of banning the use of federal funds to pay for abortion; only 37 percent favor it. In other words, Obama has decided to renege on his promise, betray the bishops and defy the American people. Risky business given that today’s Rasmussen presidential tracking poll shows only 46 percent of voters approve of Obama’s performance. Worse, only 27 percent strongly approve and 41 percent strongly disapprove of the job he has been doing. Wait until the public learns about Obama’s double cross on abortion! This doesn't surprise me one bit! Obama is a radical supporter of the culture of death and has been for as long as I can recall. He lied to the Pope, he lied to the Bishops, and he lied to the American people. I have been warning my readers about him for years. What surprises me is that anyone believed him in the first place. After all, he is the "Abortion President".